We pushed out a new version of GasBag a couple of weeks ago now, which adds a much needed feature: the ability to delete stations. The main reason for this is that despite sinking huge amounts of time into finding ways to keep our database clean, at the end of the day our systems just aren't as good as trusting you guys to tell us when a station is bad. This new feature was added by one of our interns, Takeshi Ohishi, and was an awesome piece of work from him, despite a difficult spec and demanding coding standards (read: I'm a nazi). Thanks Takeshi! Here's how it works: when you find a station that shouldn't be there (it's closed, or it's a duplicate, etc), tap on it to go through to the station details screen and then tap the "Delete this station" button, confirm the action and it will be instantly obliterated. We've now disabled our other mechanisms for identifying duplicate stations, and over the next few weeks we'll be undoing all the work that system did, because frankly it wasn't very good at what it did. So when you see new stations popping up that shouldn't be there, we'd love it if you took the time to delete the bad record (in general we prefer to keep stations with more precise addresses: eg a street number instead of an intersection, but don't stress too much about this). One last comment: we have chosen not to make a new release of GasBag Pro with this change in it. This is because we had to make a lot of changes to our code to get it to build with the latest versions of XCode. Not wanting to break things for our paying users is pretty important to us, so we're delaying adding this feature to Pro until it's seen some more testing. If the current trends hold up, it will probably be rendered obsolete by the time we get around to rolling it into Pro. Thanks to all our users for your support thus far, and thanks for helping us maintain the service for everyone. This is an incredible opportunity to join a team of talented entrepreneurs and engineers in the iPhone space. Our applications have been featured in the NY Times, TechCrunch, Wired magazine, and many other newspapers and blogs. We are fully engaged in writing innovative, user-friendly applications that drive community involvement and participation. We are a small team across California and Australia, looking to expand our Business Development resources so we can focus on what we do best. Head office is in Mountain View and we'd prefer someone close if possible. Our technology has great traction in the consumer space and we are looking to expand that by targeting relevant institutions that could utilize branded versions of our products. - Days, hours, and working location are flexible; your performance is determined by your success! 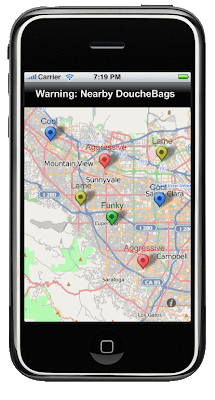 Mountain View, Calif. – April 1st, 2009 – jamcode LLC, the leader in rich-mapping applications for the iPhone and iPod Touch, today announced the launch of DoucheBag, the best way to avoid uncool bars and clubs. * DoucheBag uses the same rich-mapping technology as GasBag, GasBag Pro, and myATM, to quickly and easily show the users where the nearest clubs and bars are. * Sophisticated trust network algorithms ensure the best DoucheBag-identifiers are rewarded and their recommendations propagated more quickly. "It's harder than ever to go out and have a good time without some douchebag interfering," said Mick Johnson, CEO & Co-Founder of jamcode LLC. "Now with DoucheBag on the iPhone I can avoid them like never before." "Sometimes I just sit at home." he added. "We've taken the best algorithms around the globe, mixed them up in a glass, and added a pinch of salt," said James Gregory, CEO & Co-Founder for jamcode LLC. "Our Advanced Douche Detection (ADD) engine is second to none." DoucheBag is free on the AppStore - get it today. At last we've submitted version 2.0.4 to the AppStore. As James was alluding to before, we had some extra special features we wanted to roll out, and just as we were about to, Facebook announced Facebook Connect for iPhone at SXSW. So we went back and added that in, which to my mind makes GasBag even more cool! In short, if you log into Facebook through GasBag (hit the Info screen), then whenever you update prices or fill up you can check a box to inform your Facebook friends as well as the GasBag network. We're rolling this out for GasBag first, to be followed by GasBag Pro later. Just a quick note about a, well, smaller release than most of the others. As have many other iPhone developers, we've been pretty frustrated that we're not able to automate the process of getting sales reports from the iTunes Connect portal. It's frustrating because it means someone has to have the responsibility of logging in and downloading them every day, and we've just got better things to be doing (like making great software!). So we're trying to be part of the solution. Last night, I put together a simple script using the fabulous Beautiful Soup framework to automatically log in and download the latest daily report for you. Paragon of software engineering excellence it is not, but it does rather neatly solve this problem for us. So if you're an iPhone developer, check it out here. It's BSD licensed, meaning you can do pretty much whatever you want with it, but we'd love to hear about any novel uses you find for it, and we'll gladly accept patches for bugfixes or new features or what have you. James -- Co-founder and CTO. Liz Tay at ITNews did another great piece on us and how we've been approaching business given the recession. It's been a bit of a roller-coaster I have to say, but I'm very glad we've done so and I have a huge amount of faith both in the jamcode team and also the community that is growing and growing every day. "Some businesses forged during recessions have achieved great success. These included Cisco, funded during the recession of the early '90s, and Australian start-up Atlassian that was established during the dot-com bust." A sentiment I strongly believe in. Now's the time! We're about to roll out a set of updates to GasBag and GasBag Pro, so I wanted to briefly fill you in on what to expect, and provide some rationale for the process we're going to use to get these releases into your hands. First up, what's changing: this is primarily a bugfix release, intended to target two issues that have been frustrating users since the 2.0 release: we call them "the Sydney bug", and "the price update bug". The "Sydney bug" is where the app will unpredictably jump over to Sydney, Australia, without any really good reason to do so. This is very frustrating except for a very small percentage of our users who also happen to be at that location* :). The "price update bug" is an issue we inadvertently introduced in the switch over to the new map technology. In short, when you enter a new price, that update isn't reflected on the map when you go back to it. The prices are getting to our server just fine, but no-one has any way to know that. We're still debating whether to add a couple of small pieces of functionality, but if we do include them, we'll be sure to let you know. We're hoping that the new release will be out late next week, but as always we're subject to Apple's approval process, so we can't give any guarantees. But the more important part of this release is that we're experimenting with a new, staged release cycle. The idea is that we're going to roll these new features into the free version of GasBag, and assuming that all goes well, we'll fold them into Pro a little while later. If it doesn't go so well, we'll repeat the process until we get it right. Why? Well, we've had a lot of feedback about our apps, on everything from our icon to our database, but nothing angers people more than unstable software (and rightfully so). Now don't get us wrong, this release has been through the same testing process that all our software goes through, and we think it's solid, but it's also true that every time we've done that, you guys have managed to find something we didn't think to test for. While we hugely value all our users, we feel that it is fair that people who have actually put down hard-earned cash get the benefit of this "crowd-testing". Ultimately, this is a bugfix release, so we're hoping that no-one's going to be missing out on anything too critical, and we're only talking about a week or two. So if you're on GasBag Free, look forward to an update in the next week or so. If you're on Pro, you'll get the update as soon as we can manage, and you can be sure that it's ready to rock when it hits your phone. Let us know what you think of the new release process in the comments -- we're always trying to do the right thing by our users. Let us know how we're doing. [*] as it happens, I live quite close to the area where "the Sydney bug" dropped you, so for a long time I wouldn't believe the rest of the team that there was anything wrong!